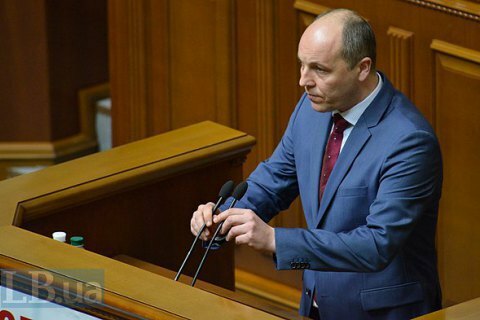 Speaker Andriy Parubiy on behalf of the Ukrainian parliament has called on international organizations and the Security Council of the United Nations to respond to the suspension by the Russian Ministry of Justice of the activities of the Crimean Tatar self-styled government Mejlis (Majlis) as an extremist organization. He stated this at a meeting of parliament. "I, on behalf of the Ukrainian parliament call on international organizations to react to this crime. I ask the Ukrainian Ministry of Foreign Affairs to consider the possibility of immediately calling a meeting of the UN Security Council on this issue," Parubiy told parliament. He described the suspension of the activities of the Mejlis as a manifestation of fascism. "This is the first time since the era of dictators Stalin and Hitler that a nation is declared extremists. This is a clear-cut manifestation of Russian fascism. On 18 May 1944, Stalin issued criminal orders that resulted in the horrible tragedy of the Crimean Tatar people. On 18 April 2016, the Russian totalitarian authorities outlawed the Mejlis. The actions of Russia once again confirm the old definition of this country as the 'prison of nations'," Parubiy stressed. The speaker said he believed that Ukraine should spare no efforts to recover Crimea from the Russian occupation. On 18 April, Russia officially banned the Mejlis as an extremist organization. Earlier, on 13 April, the Russia-controlled "prosecutor" of the Crimea Natalia Poklonskaya issued orders to suspend the activities of the Mejlis. In response, Crimean Tatar leader Refat Chubarov called for an urgent meeting of the UN Security Council.